Los Angeles voted overwhelmingly for Hillary Clinton in the 2016 election. 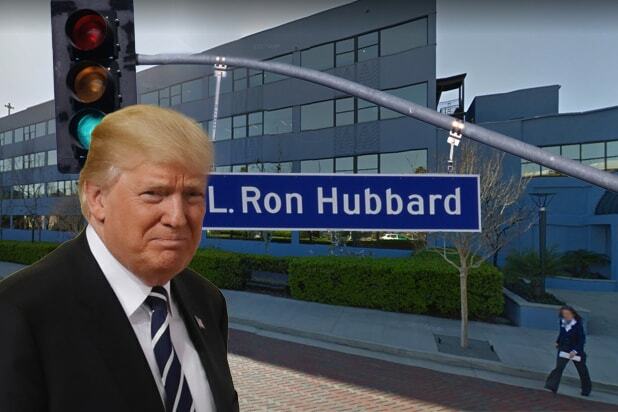 Of the city’s 1,700 precincts, only seven went for Donald Trump, among them the area in Hollywood that surrounds the Church of Scientology‘s “Big Blue” complex, so named for the vast blue edifice that dominates it. About half of the roughly 1,100 voters registered in the precinct listed addresses of Scientology properties, according to the Los Angeles Times. It was the first time in 17 years since that chunk of Hollywood went Republican. Recently, I visited the neighborhood to find out why. It’s unclear whether Scientologists swung the precinct for Trump, and the church did not respond to TheWrap’s requests for comment. But former members and Scientology experts believe Scientologists may have smiled on the Republican candidate because of Trump’s repeated promises to “totally destroy” the Johnson Amendment, which ensures that nonprofit groups and religious organizations remain non-political or risk losing their tax-exempt status. Scientology has a long and well-documented history of fighting with the government over its tax status. TheWrap asked the church’s media representative about all of the practices described in this article — including whether or not the church “suggests” to its parishioners who they should vote for — but got no response. While the church is headquartered in Clearwater, Florida, Los Angeles has by far the largest concentration of Scientologists in the world, according to the church. Scientology is well known for its many Hollywood followers, including Tom Cruise and John Travolta, and its most visible presence is in Hollywood, where it owns a former hospital that houses Scientology’s West Coast headquarters, the Pacific Area Command Base — Scientology’s name for the “Big Blue” building and the church’s Information Center on Hollywood Boulevard. 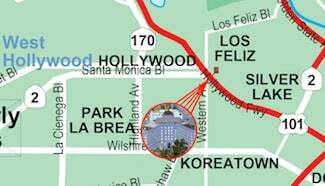 The precinct is located on the east edge of Hollywood between Sunset Boulevard and Fountain Avenue. Running through it is L. Ron Hubbard Way, a manicured cobblestone street named after the group’s founder. It resembles an idyllic cul-de-sac on a ’50s family sit-com — except for an abundance of security cameras. But the church got its way because it owned 55 percent of the properties within the precinct. Soon after the name was changed, the Times noted that 183 neighborhood residents wrote to City Hall to applaud the change, while nine complained. Though the street is technically city property, security guards in uniform stand at each end of the road. Non-Scientologists are free to roam the sidewalks, though few do. It’s not hard to spot members of the church, who walk around in airline-style uniforms: a white button-down shirt, a tie, a dark vest and black slacks. The women I saw wore their hair pulled tightly into buns, and almost everyone walked in determined, hurried steps. The few Scientologists willing to speak said they weren’t into politics. A couple of staff members (one from Italy and one from Colombia) were quickly whisked away by people who appeared to be their superiors. When I asked whether I could speak to a church official, a young Scientologist, who said she was from Hungary, kindly offered to show me to the lobby. The reception area was filled with large touch screen monitors extolling the virtues of the church’s humanitarian programs. After I explained that I was a reporter writing a story about Scientology and Trump, a representative gave me a number to call. As I made my way back to my car, I noticed the Hungarian staffer walking in the same direction but on the other side of the street. As soon as we made eye contact, she disappeared into a non-descript complex nearby. I called the number. A church operator took down my information, but no one called back. My follow-up email containing a list of specific questions also went unanswered. Kronwall, who said he’s been a member of Scientology for 42 years, believes Hillary Clinton and Democratic policies were responsible for Trump’s win of the precinct. “The Democratic party is leaning toward psychiatric programs and getting mental health programs in schools,” he said. Kronwall also mentioned that electroshock therapy was making a comeback, another reason why Democrats couldn’t be trusted. Democrats and Repubiclans did not respond to our requests for comment. The Democratic platform, which you can read here, contains no mention of electroshock therapy. There are several references to treating mental illness. The Republican platform, which you can read here, also contains several references to treating mental illness — and no reference to electroshocks.